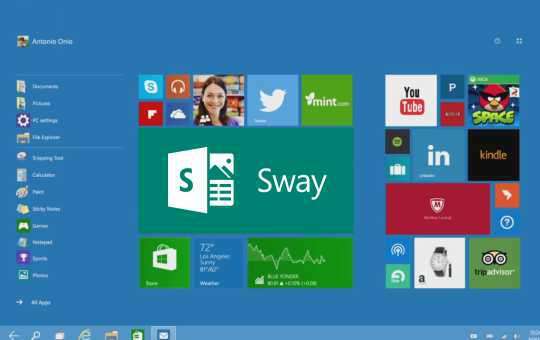 Microsoft has declared that its Sway app is out for preview and it’s been launched by Windows 10. Sway app designed as a presentation app with automated design elements and responsive design to fit on multiple screen sizes. The app lets you to import photos from their gallery, add text blocks, and import content from Facebook, Twitter & YouTube. As per The Next Web, the Windows 10 app comprises of few more features than the web version. It can be used without internet. When loading web-based content like YouTube videos or interactive maps will require an internet, but other elements will now be accessible without the internet. Again added in the app’s navigation panel that shows groupings of content like images, text, videos, tweets, etc. Now users can share Sways to Microsoft’s portal for displaying Office documents on the web. Windows Sway App is easily available in windows store.